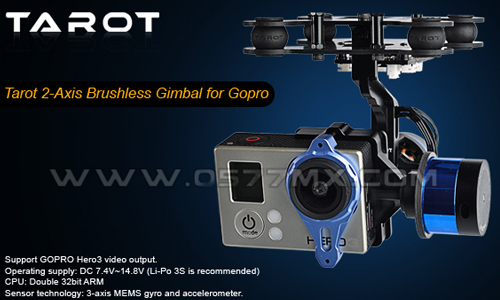 Tarot T-2D gimbal is designed for the Gopro Hero3, which is widely usedinfilm,television productions, advertising aerial photography, etc. Using 6061T6 aluminum alloy full CNC precision machining and brushless motor driving,its overall framework is designed with the idea of compact, easy installation, high precision, lightweight, high stability and many other characteristics. Evenif the aircraft is in high-speed flight, it can still stabilize and control the Goprocamera precisely with the highest stability, so pictures or videos output can reach the best quality.